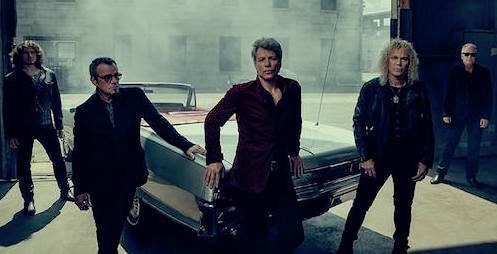 The group conquered the glam masses in the ’80s, but Bon Jovi has since evolved and ascended to the status of rock royalty. The band’s latest release,This House Is Not for Sale, is its sixth number one album, and the guys were inducted last month into the Rock and Roll Hall of Fame, 35 years after being signed to Mercury/PolyGram Records. But when the group headlines two shows at Madison Square Garden on May 9th and 10th, do not expect a nostalgia ride. Bon Jovi has scored plenty more hits since the ’80s, and nearly half of their current sets are post-’90s songs. Shulman attended the band’s Rock Hall induction last month and a celebratory party organized by Jon’s wife Dorothea that brought together the key players who helped the group achieve their massive success, including former manager Doc McGhee, songwriter Desmond Child and former members Richie Sambora and Alec John Such. Child’s husband Curtis Shaw and their twin sons Roman and Nyro (Jon’s godsons) also attended the events. “The party had these two long tables, it was like ‘Downton Abbey,’ ” says Child, who recently received the ASCAP Founders Award. “It was the most beautiful, perfectly executed event ever. The show was the next day, and everything went flawlessly. I don’t think they’ve played so exuberantly ever. They were so excited.” Child particularly praised the Bon Jovi camp for their gracious treatment of Sambora and Sambora’s partner Orianthi, and he was moved seeing Bon Jovi and Sambora perform onstage again. They get a lot of flack for appealing to soccer moms (who used to party their asses off in the 80’s, I was there), and not being heavy enough, but they handled their HOF induction with dignity, respect and humility from all band members new and old. Their peers would kill to be still selling out arenas like they still do. I prefer Richie Sambora’s first solo album to any Bon Jovi record, but I respect their longevity and humility and ability to laugh at themselves. It was great to see Alec get the respect he deserves. (Take note EVH).